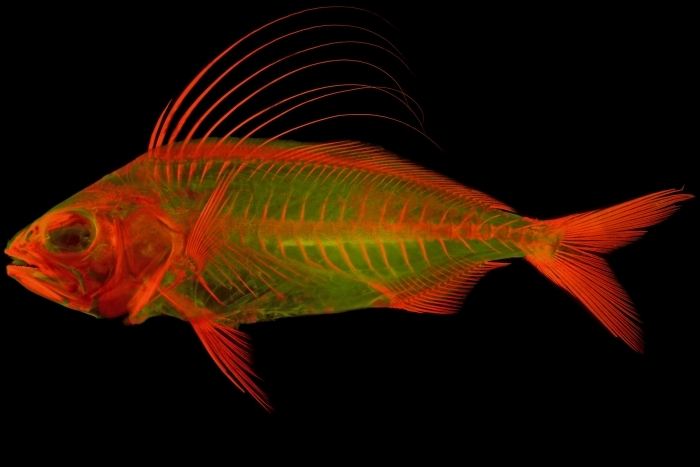 A pair of new imaging techniques is set to make waves in the study of vertebrate biology. The first has solved an “impossible” problem. The second is the discovery of fluorescence in protein previously used for staining bones, allowing structures to be observed in finer detail than ever before. Combined, the two techniques have been used to create some simply breathtaking images. And that’s actually part of the point. We’ve all found ourselves in the position of reading a textbook or a scientific paper, struggling to make sense of the words, when a carefully inserted image slams comprehension into place. Humans are very visual creatures. “People are inherently interested in how these skeletons look,” said ecologist and biologist W. Leo Smith, associate curator at the University of Kansas Biodiversity Institute & Natural History Museum. The first technique involves skeletons that have been stripped of all their muscles. The problem with these is that muscles are what keeps the bones from flopping over like a soggy dishrag. This makes taking images of nicely posed skeletons that show off the bones to their best advantage “impossible,” the university said in a statement. Or rather, it did. “It’d be great to pose a snake coiled, but before now they just wouldn’t hold in that pose,” Smith said. The solution? A mixture of glycerine and gelatin, with 40 percent glycerine. The specimen can be suspended in this matrix for posing. It’s clear enough for photography, and holds the bones in place like a jelly. When imaging is complete, the matrix can be gently washed off the specimen with warm water, without causing any damage. The second exploits a property of the dye alizarin-red, commonly used to stain bones for identification purposes. Smith discovered that, when under the right wavelength of light, it fluoresces brightly. This allows the use of fluorescence microscopy to help identify bone features, identify skeletal elements in specimens, and differentiate between soft tissue and skeletal tissue. When combined with green fluorescence, alizarin-red helps produce highly detailed images. “Alizarin red is used to dye a specimen’s bones, and it fluoresces like a Grateful Dead poster,” Smith said. This discovery was actually made a while ago, and reported last year at the annual meeting of the American Society of Ichthyologists and Herpetologists. Use of the technique is already starting to spread like wildfire. It’s proving to be a powerful tool for the study of skeletal anatomy – and for communicating that research, not just with the scientific community, but with anyone who wants to learn. And that’s valuable beyond words. The two techniques have been described in a paper published in the journal Copeia.